The American brand, Ford, in collaboration with Harley-Davidson, unveiled their latest creation: the 2012 Ford Harley-Davidson™ F-150, which delivers on the custom cool design that the lineup has been known for, with new snakeskin leather interior accents, a new stylized bodyside graphic and a new wheel and premium paint color. The 2012 Ford Harley-Davidson F-150, just like the previous models, comes with some unique visual features and upgraded equipments.The same collaboration between this two American brands has produced 10 F-150 models, as well as six Super Duty F-250 and F-350 models, and in 2009 the first Harley-Davidson F-450 edition truck. The new model will be available with a new exterior colour – White Platinum Tri-Coat and it sits on 22 inch machined aluminium wheels. 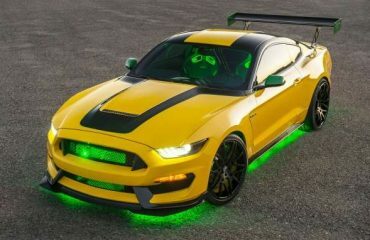 The car features a billet style bright chrome grille, a fully integrated deployable running board and standard equipment that includes a power sunroof, a 4.2 inch productivity screen and a Remote Start System. In addition, the interior chrome surfaces feature a satin finish and interior trim panels are covered in high-gloss Tuxedo Black paint, while the console lid and upper steering wheel carry the snakeskin leather. The scuff plate features brushed aluminum with snakeskin texture. These brand goes even further and offers premium snakeskin leather-trimmed seats come with accent color inserts. As for the features, in standard form this model comes with a 4.2-inch LCD productivity screen, voice-activated Navigation System, power moonroof, rear view camera, second-row heated seats, ambient lighting, remote start system, a 110-volt power inverter and power-adjustable pedals. The 2012 Ford Harley-Davidson F-150 is powered by Ford’s 6.2-liter V8 engine that delivers 411 horsepower and 434 lb.-ft. of torque and provides a maximum trailer towing capability of 7,500 pounds. So far pricing and availability have not been announced.